Gearbox is excited that you're excited about Duke Nukem Forever. Just a few years ago, the chances of actually seeing Duke Nukem Forever on shelves seemed about as likely as seeing a unicorn driving a bus. But since a new developer took over, it seems much more likely that we'll one day actually get to play it, and Gearbox thinks that talk of a demo only helps make that idea more real. Duke Nukem Forever has been in development since 1997, with released dates announced, missed, re-announced and re-missed. Gearbox's head of marketing Steve Gibson said that after such a long time and so much disappointment, the sense that someone was making solid, concrete plans about the game - like giving early access to the demo to those who bought the Game of the Year edition of Borderlands - was getting people excited about the game all over again. 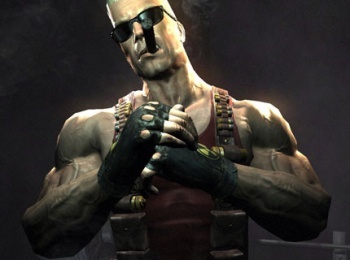 Gibson said he was "thrilled to death" that Gearbox had been able to rehabilitate Duke Nukem Forever and turn one of the longest standing jokes in gaming history into a game that people were actually looking forward to. There's no release date planned for the Duke Nukem demo just yet, but Gibson thought that people would be "surprised" by the content of the demo and what happens in it. He implied it would be a pleasant surprise though, as he said he didn't want to spoil it before the demo came out. Duke Nukem Forever is scheduled for release on PC, Xbox 360 and PS3 early next year. Y'know, provided that it isn't cursed or something.